This Thermogenic (fat burning) Whey Protein is applicable for consumption by both male and females. It is available for use to a variety of consumers from your everyday fitness enthusiasts to sprinters and bodybuilders. It is best for losing body fat/weight loss, increasing muscle recovery/mass and overall athletic performance. This protein contains ingredients which will help transfer fat cells into usable and assist in fat reduction as well as helping muscles recover faster to help the consumer output more energy to burn more fat. 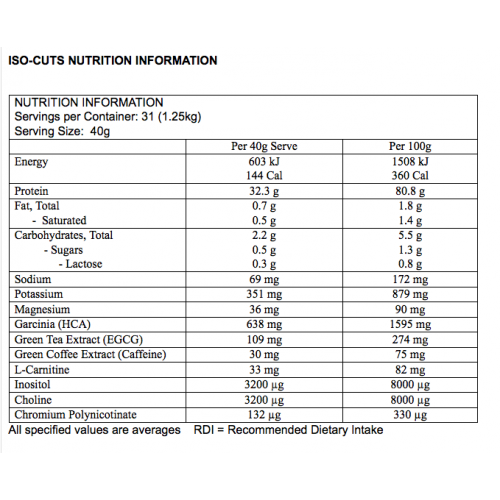 Isocuts contains the most efficient thermogenic fat burning substances such as EGCG, Hydroxycitric acid, and caffeine to assist in your weight loss plans while also preserving lean muscle mass. To promote muscle recovery and enhance energy levels, this formula also contains Green Tea extract and L-carnitine to improve the process of fat burning and also act as an antioxidant. Whey Protein Isolate is among the best types of Whey due to it having the highest protein content and the lowest carbohydrate and fat content than any other whey. This is vital for weight loss and lean muscle growth. Green Tea contains rich antioxidants such as polypheniols and catechism which helps stimulate your metabolism which directly helps increase weight loss. Hydroxycitric Acid prevents muscle fatigue and curves appetite while also decreasing the fat storage capacity. Caffeine primary purpose is to provide alertness and sustained energy throughout your workout, giving your mind a wakeup call. L-carnitine ultimately helps the process of converting fat into a use of energy in both cardiac and skeletal muscle cells. This is an essential supplement that can increase exercise performance, fat metabolism and cognitive ability. Mix 1 (one) scoop with 250mL of water and consume immediately after completing your workout (post-workout) Can be taken for breakfast and or whenever protein is needed in the day. Can also be consumed 30minutes before workout if needed.